With a well-known name like Roland, it is no surprise that they have continually been selected in the top 100 companies for streaming products by Streaming Media Magazine each year since 2012. It is also no surprise that their affordable and portable line of A/V products have found a home at Stream Dudes. Leading with products to address the needs of houses of worship, clubs/casinos, theaters/performing arts venues and corporations, Roland Pro A/V offers a robust lineup of solutions. From A/V Converters to All-In-One A/V Mixers, Roland products can easily provide solutions for any workflow. The VR-4HD was designed for single-person operation, and enables easy switching and mixing of sound and video. Digital Signal Processing (DSP) along with hardware faders, buttons and touch screen interface, make it an easy A/V solution for anyone to learn and use. 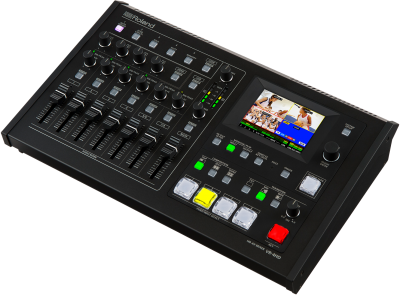 Integrating a digital audio mixer, video switcher, multi-viewer touch screen and USB video/audio streaming interface, the VR-4HD is ideal for schools, churches, council meetings, corporate events, training sessions, or any other live event. Flexible and versatile, the Roland V-1SDI makes switching 3G SDI and HDMI cameras and sources easy and affordable. Compact and portable, the V-1SDI comes complete with a T-Fader, back-lit buttons, and delivers professional switching results. With support for 3G-SDI, the V-1SDI can operate at full 1080p resolution and can take advantage of the longer cable distance runs associated with SDI. Recipients of TV Technology’s coveted STAR Award presented at the 2013 NAB Show, the VC-1 Video Converter series is a real winner. Featuring an on-board re-clocker, support for both level A and B 3G-SDI, as well as input from analog sources (RGB and component), the VC-1-SC is a must have tool. 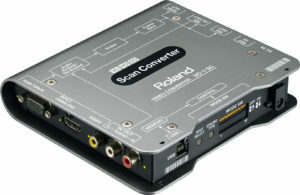 Add in a built-in scaler, along with HDCP compliance, and selectable audio embedding (or de-embedding)- and the Roland VC-1-SC becomes the star of any A/V workflow. As you can see, Stream Dudes is continually growing to meet your needs and specific applications. Roland Pro A/V adds critical video production components to our already extensive lineup, while allowing us to provide our customers with quality and affordable streaming solutions. To learn more about Roland and how their products can help you, Contact Us for personalized workflow guidance.